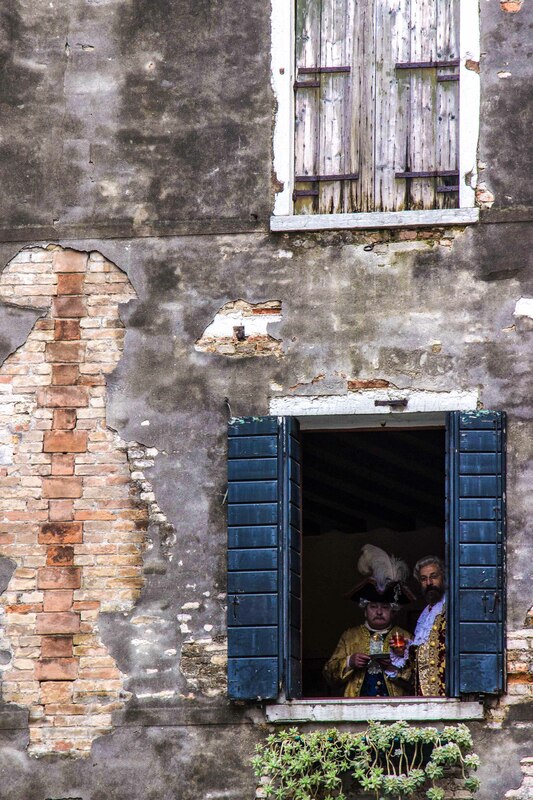 I wasn’t able to make it to the Venice Carnival this year as I’m in a play and can’t miss the rehearsals. So, I’m post photos from previous years instead. I love the expression on the gentleman’s face on the left. He doesn’t look too happy. Maybe his wig is itching him, or he’s wishing he was drinking an Aperol Spritz like his companion. I felt a bit like a time traveller watching them both anyhow – was it really the 21st century?!!! The wonderful thing about Venice is that the backdrop looks so historic, and there are no cars, so once people step into period costume you really can start to believe that you have stepped back in time. I love this photo, Eleanor, and your thoughts behind it! As for being in a play, how awesome! What play is it and when does it open? I used to stage manage community theatre and had a few turns on the boards myself :) It was definitely a fun period of my life. Break a leg! A wonderful photograph contrasting the richness of the costumes with the brickwork. The brickwork I particularly liked. It is so atmospheric. I felt I could touch it. A formal photograph of the pair would not compare. Oh, I just love this photo. It is like time travel. How lucky you were to experience such a special event, Eleanor, and what a wonderful job you did bringing it into our homes through your photos. Good luck with the play. Your adventures never cease to amaze me.